Multi-services energy platforms are not a novel idea. What constitutes the very heart of Café Lumière’s specificity is a multi-facetted approach tackling the financial, impacting and technological issues underlying the sustainability and scalability of such an initiative for the Base of the Pyramid, notably by targeting collective services, often left out of those solutions. Currently available electricity-supply solutions for rural communities face strong limitations: grid extension is not economically viable for scarce communities, diesel generators are costly and polluting, Solar Home Systems (SHS) cannot supply large loads and the electrification of collective services suffers from a lack of long term funds. 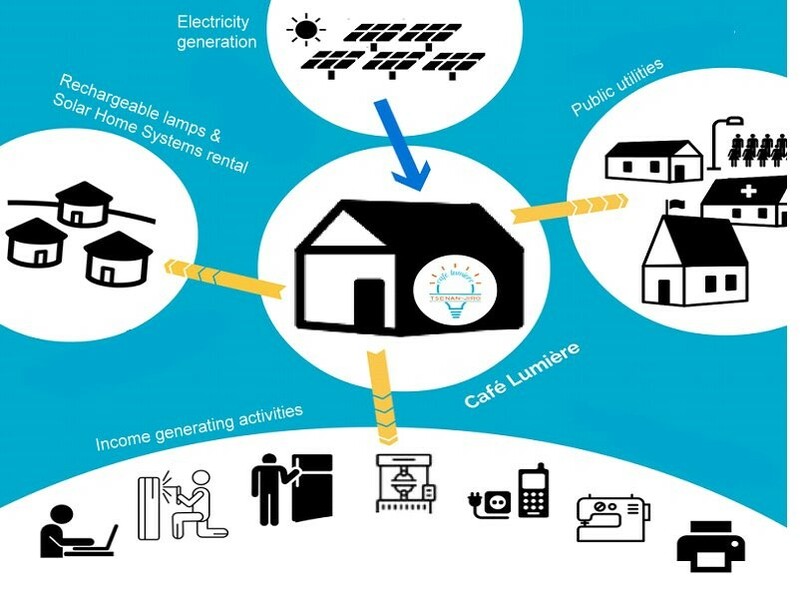 The Café Lumière (Light Café) solution is a multi-services energy platform, mainly powered by solar energy. Managed by a private operator, it provides an intermediate solution in between the grid and SHS solutions, allowing the electrification of small rural communities based on their needs: to foster economic growth, cover domestic needs but also improve the quality of community-level services through a contribution on sales revenues covering their electrification. It combines innovative technologies to reach full cost efficiency and easy scalability. A local gender balanced committee is progressively being put in charge of its governance through tailored skills-transfer, making sure existing institutions and women are fully empowered in the process. Café Lumière in Madagascar relies on a public private partnership involving an NGO (Electriciens sans frontières), a local private operator (EOSOL), the Malagasy agency for rural electrification (ADER), a research foundation (FERDI) and equipment suppliers. An on-going first phase of the project (Phase 1), already financed and initiated in 2016, aims at implementing 6 Café Lumière in 6 target communities by 2019, providing universal access to electricity services to 20 000 rural inhabitants in Madagascar. The Café Lumière® (Light Café) solution, developed as a multi-services energy platform, mainly powered by solar energy.